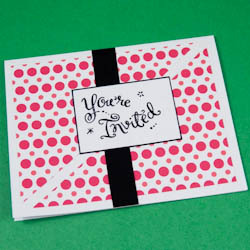 Make a set of six invitations from a single sheet of letter-size, patterned paper! 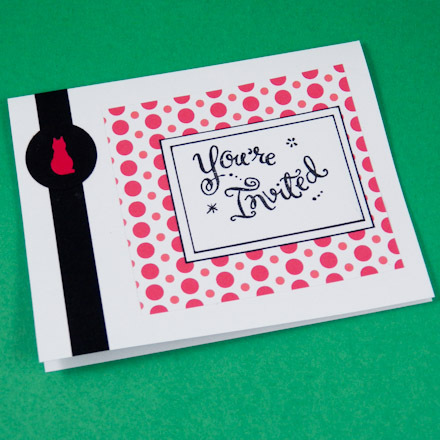 In this tutorial, you'll learn how to create invitations that follow a theme while expressing your creativity. 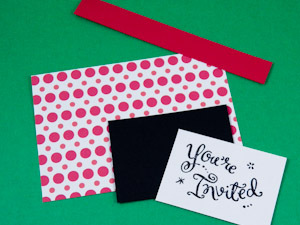 In about the same amount of time that it would take you to make a batch of identical invitations, you can create unique invitations to send to each of your guests! 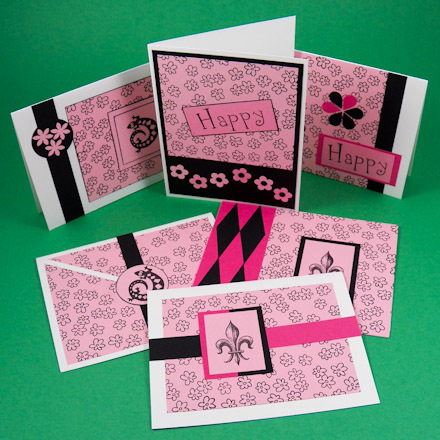 This greeting card tutorial builds on previous tutorials in the original Greeting Card Class set of tutorials, especially #1: Four Patch Cards and #6: Paper Weaving Cards, for color selection tips. If you are new to cardmaking, review these tutorials before starting this one. 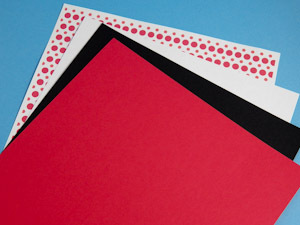 Patterned paper: 8½" by 11"
This is a Greeting Card Class 2 tutorial and is rated EASY to do. Select a patterned paper as the central design element of your invitations. For the strongest visual impact, choose a paper with a small repeating pattern and just one or two colors on a white background. For the sample invitations in this tutorial, Aunt Annie's Wild Red Dots ePaper was printed on white cardstock. 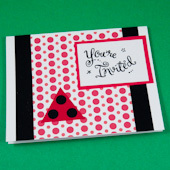 You will also need cardstock in two colors that coordinates with the patterned paper. 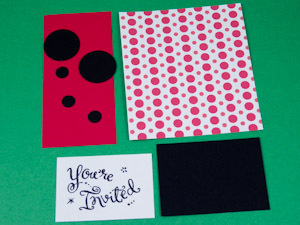 For the sample cards, letter-size sheets of red and black cardstock were used. 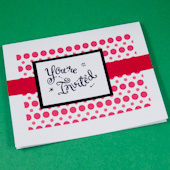 In addition, a sheet of plain white cardstock is needed for the "You're Invited" message card featured on each invitation. Cut the patterned paper into six sections. First, cut the paper into three parts with cuts across the 8½" width at 3¾" and 7½" along the 11" length. You should now have two 3¾" by 8½" pieces and one 3½" by 8½" piece. Cut one 3¾" by 8½" piece in half to get two 3¾" by 4¼" pieces. Cut the other 3¾" by 8½" piece at 5" along the 8½" side to get 3¾" by 5" and 3¾" by 3½" pieces. Cut the remaining 3½" by 8½" piece at 4¾" along the 8½" edge, resulting in 3½" by 4¾" and 3½" by 3¾" pieces. Using a rubber stamp or computer software, create "You're Invited" message cards. 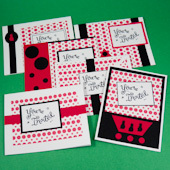 For stamped cards, cut six pieces of white cardstock that are a bit larger than the stamped message. On the sample card, the message cards are about 2¼" by 1½". Stamp the message in black ink on each card. 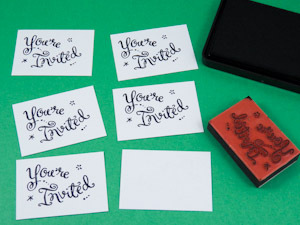 If you are using computer software, draw six text boxes about 2¼" by 1½" and fill each box with "You're Invited" and a couple of stars. Print the page to white cardstock and cut out the message boxes. Tip: You can also download Aunt Annie's "You're Invited" or "It's a Party! ", or "Please Join Us" message cards, print on white cardstock, and cut out. Each sheet has 18 message cards. Tip: You can also download Aunt Annie's "Join Us" or "You're invited!" message cards for a Valentine's Day party—print on white cardstock, and cut out. Tip: Or for baby shower invitations download Aunt Annie's "Please Join Us" or "It's a Boy! ", or "It's a Girl!" baby shower message cards, print, and cut out. There are 18 message cards per sheet. For the largest number of creative options, pre-cut mats and strips from the coordinating color cardstock, then use the precut cardstock to assemble cards however you like. 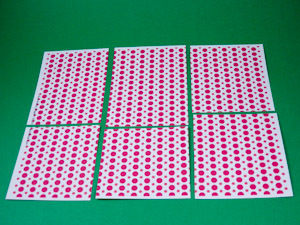 Cut one or two card mats 4" by 5¼", cut three or four message card mats ¼" larger than the message cards, cut several ½" to 5/8" wide strips of cardstock, and punch out circles, dots or other shapes. You can also follow the cutting and assembly instructions for the six sample cards. 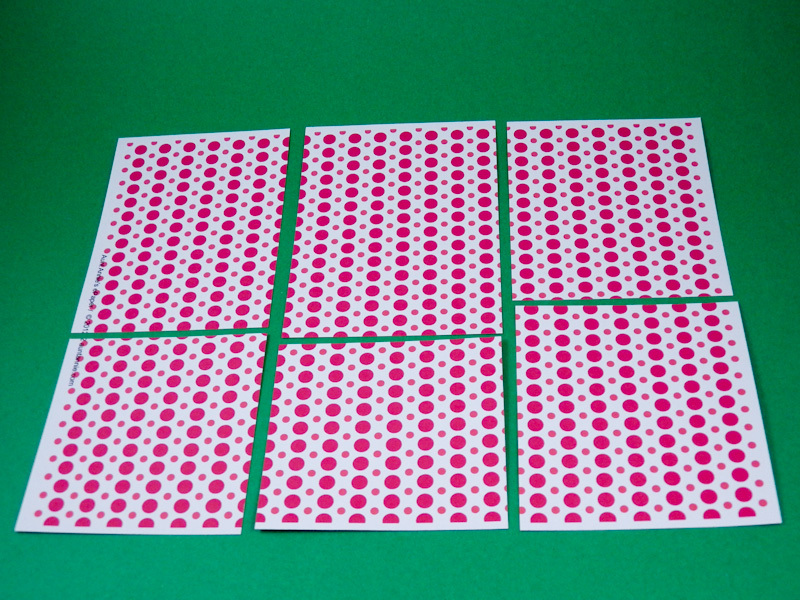 Card 1: Use the 3¾" by 3½" patterned piece and a message card. Cut a 4" by 5¼" black background mat and a 1" by 3" red strip. Punch black cats and ½" red dots. Trim white margins from the patterned piece, if needed. Edge message card with black marker. Glue card parts together as shown. Card 2: Use the 4¾" by 3½" patterned piece and a message card. 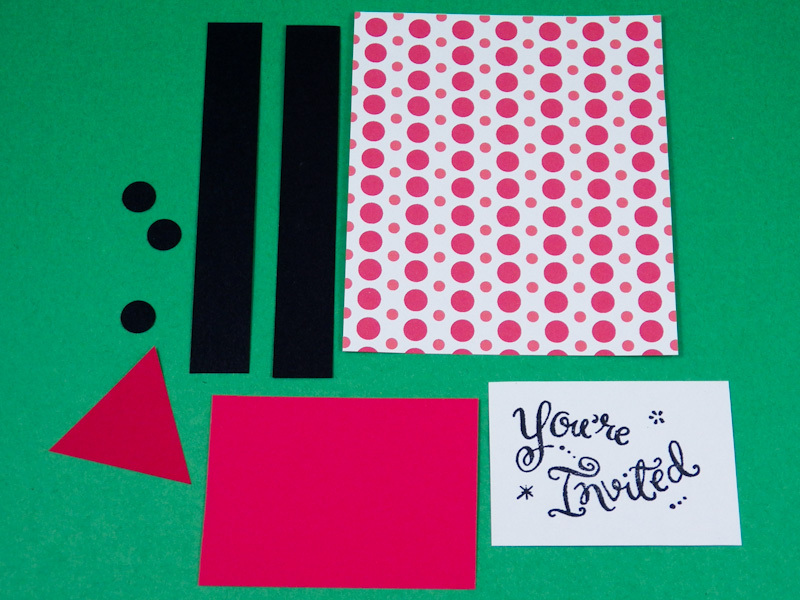 Cut a black mat ¼" larger than the message card and a 5/8" by 4" red strip. Trim white margins from the patterned piece, if needed. Glue message card to black mat. Cut red strip in two pieces to fit on either side of the message card. Glue card parts together as shown. 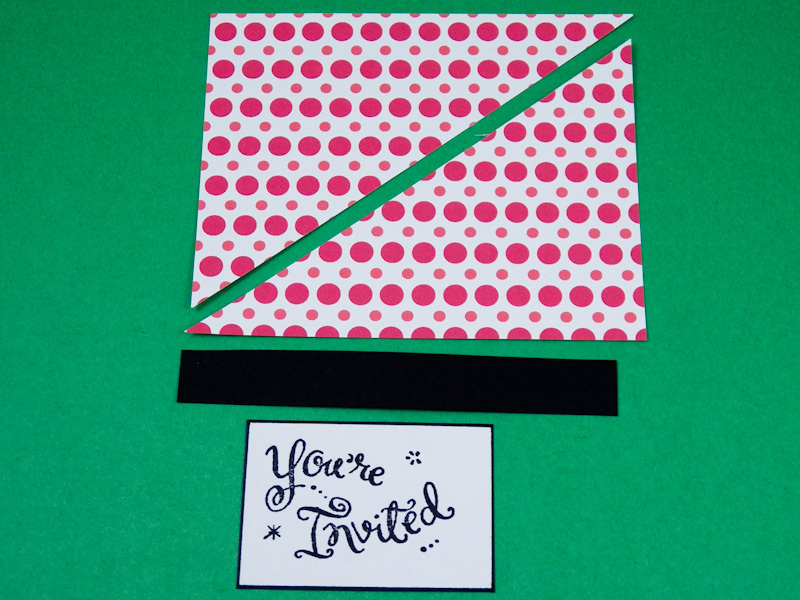 Card 3: Use the 3½" by 3¾" patterned piece and a message card. Cut a white mat ¼" larger than the message card and a 5/8" by 4¼" black strip. Punch a black 1" circle and a red cat. Trim white margins from the patterned piece, if needed. Edge message card and mat with black marker. 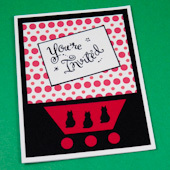 Glue message card to white mat and red cat to black circle. Glue card parts together as shown. Card 4: Use the 5" by 3¾" patterned piece and a message card. Cut a 5/8" by 4¼" black strip. Trim white margins from the patterned piece, if needed. Cut patterned piece in half on the upper-right to lower-left diagonal. Edge message card with black marker. Glue card parts together as shown. 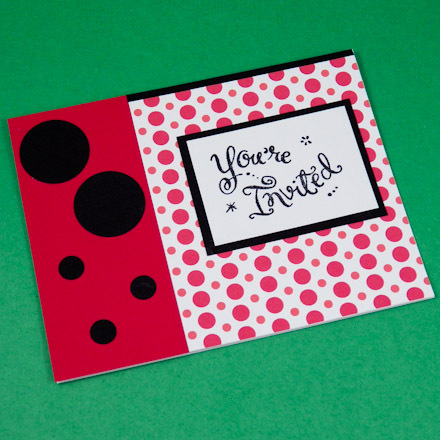 Card 5: Use a 4¼" by 3¾" patterned piece and a message card. 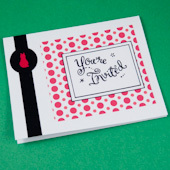 Cut a black mat ¼" larger than the message card and a 2" by 4¼" red strip. Punch black circles in a variety of sizes. Trim white margins from the patterned piece, if needed. 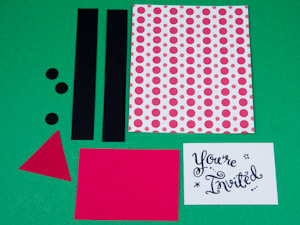 Glue message card to black mat and black circles to red strip. Glue card parts together as shown. Tip: Any white card showing through can be covered with narrow black strips. Card 6: Use a 4¼" by 3¾" patterned piece and a message card. Cut a red mat ¼" larger than the message card and two 5/8" by 4¼" black strips. Cut a 1" red triangle and punch 3 small black circles. Trim white margins from the patterned piece, if needed. 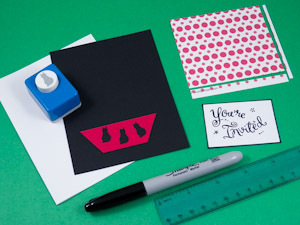 Glue message card to red mat and black dots to red triangle. Glue card parts together as shown. That's it! Your invitations are done! Tip: The Wild Red Dots ePaper was used to make the sample cards in this tutorial. 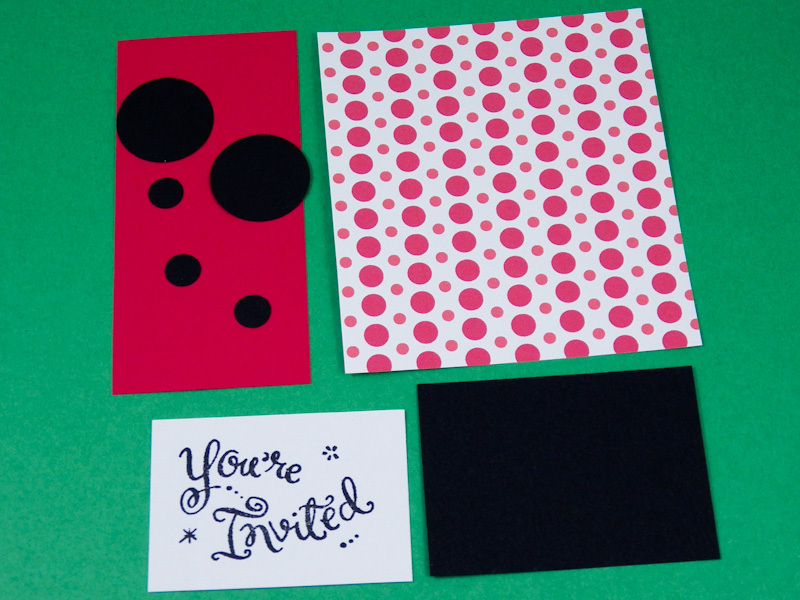 Invitations can also be made with the Wild Purple Dots and Wild Green Dots ePapers or other digital downloads. 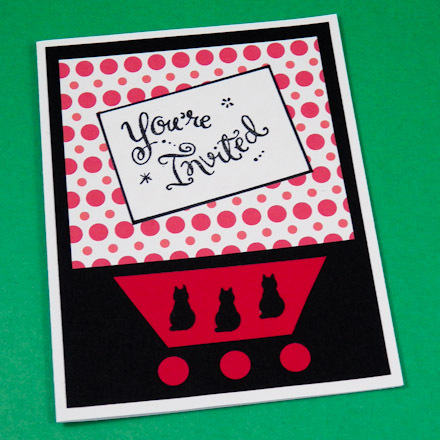 Download and print Aunt Annie's "You're Invited" or "It's a Party! 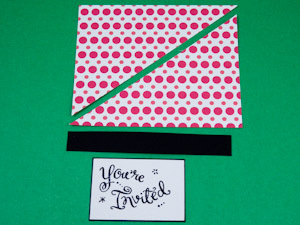 ", or "Please Join Us" message cards and cut out. There are 18 message cards per sheet. Pick paper in red or with hearts and create Valentine's Day party invitations using Aunt Annie's "Join Us" or "You're invited!" 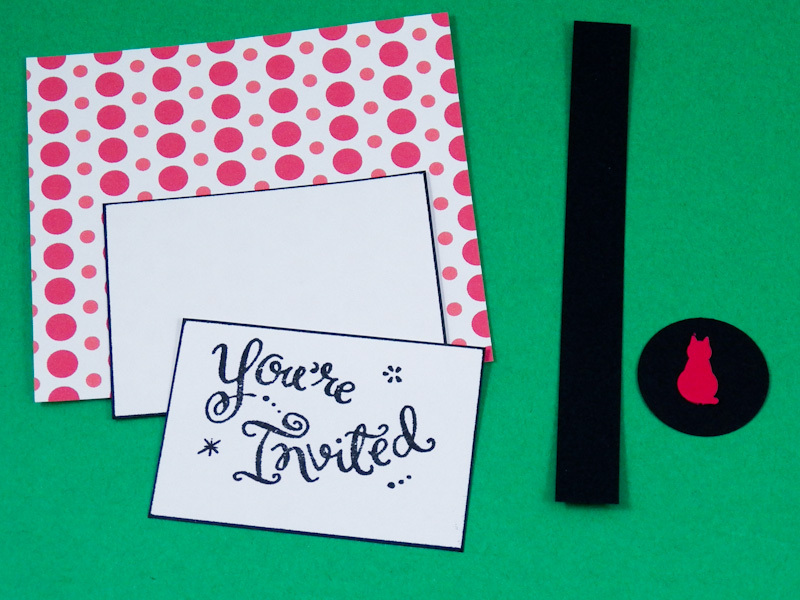 message cards for a Valentine's Day party—just download, print, and cut out. Pick a baby color theme and create baby shower invitations using Aunt Annie's "Please Join Us" or "It's a Boy! ", or "It's a Girl!" message cards—just download, print, and cut out. There are 18 message cards per sheet. 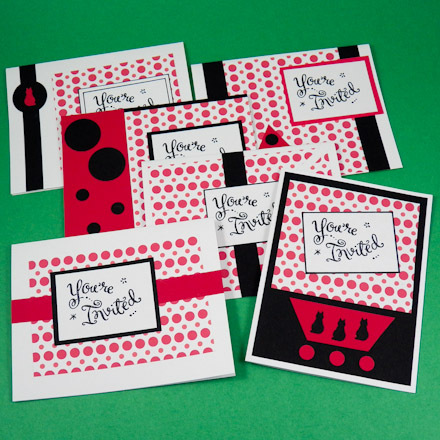 Tip: Make card sets using patterned paper with a light background. Tip: Make your own patterned paper by stamping a small image on white or light-colored cardstock. See the Christmas Card Set tutorial for more Christmas cardmaking ideas!